New Rochelle, NY, March 30, 2018 — mRNA drugs offer a promising new approach to deliver therapeutic replacement proteins, and novel strategies designed to engineer more stable and active proteins are further enhancing the potential of mRNA therapies. Specific examples of sequence engineering that led to improved expression, duration, and enzymatic activity of target proteins are reported in a study published in Nucleic Acid Therapeutics, a peer-reviewed journal from Mary Ann Liebert, Inc. publishers . 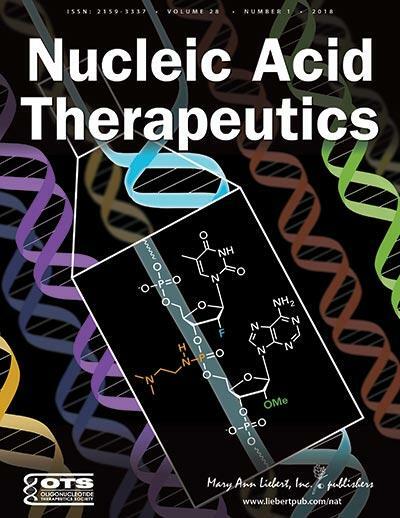 The article is available free on the Nucleic Acid Therapeutics website until April 30, 2018. The article entitled "Leveraging Rational Protein Engineering to Improve mRNA Therapeutics" is coauthored by Romesh Subramanian, Alexion Pharmaceuticals, Cambridge, MA and colleagues from Alexion, New Haven, CT. The researchers described the methods they used to engineer specific protein sequences and demonstrated the positive effects this had on protein expression in mice. Sequence engineering was also able to improve the thermostability and activity of the therapeutic enzymes. "Developing protein variants with improved stability and activity should reduce necessary dosing frequency, and hence improve patient compliance" says Executive Editor Graham C. Parker, PhD, The Carman and Ann Adams Department of Pediatrics, Wayne State University School of Medicine, Children's Hospital of Michigan, Detroit, MI.